There are a variety of methods that can be used to clean metal parts of contaminants. These include using chemicals, fluidized beds, as well as processes like cryogenics, and sand blasting. However, each of these methods have certain drawbacks which makes them difficult to use. Armature Coil Equipment (ACE) Burn off ovens are excellent solutions as they provide more benefits than drawbacks. Here, we discuss why burnoff ovens should be chosen as the parts cleaning method of choice. While each of the earlier mentioned cleaning methods have their advantages, it is certain primary limitations that makes them risky. Chemical Cleaning: This method involves using chemical solutions to remove contaminants from a component. It can perform uniform cleaning. Time required for decontamination is reduced by nearly 50%. It generates less waste material compared to other material cleaning methods. Chemicals cannot remove inert materials. Only authorized personnel can perform the cleaning process. The use of chemicals can prove to be hazardous for the user and the environment. The components to be cleaned can get damaged due to the use of harsh chemicals. Heavy deposits need to be first be cleaned by hand before using the chemical solutions. Cleaning metals using chemicals is an extremely expensive process, in terms of procuring the chemical products, as well as disposing of them once the cleaning process has been completed. Sandblasting: This is a process where extremely fine bits of material are propelled onto a component to clean its surface. It is an easy to perform process. It does not require a lot of machinery. Continual exposure to the sand blasting material can lead to lung diseases. It has to be done in a ventilated area to prevent personnel from choking from the material. The blasting process can cause tiny metal particles to fly out at high velocities. If these particles come in contact with the skin, it can be extremely harmful and painful. Fluidized Beds: Also known as ultrasonic cleaning, fluidized beds use ultrasonic energy to remove contaminants from parts. This method is good for cleaning delicate parts, or components with small holes, crevices, or apertures. It can only be used for cleaning multiple components. If the component has thick layers of dirt or grease, these layers can be difficult to remove. Large and heavy parts cannot be cleaned completely. Cryogenics: In this method, liquid nitrogen is used to remove paint and coatings from parts. It can be used to strip parts of oils, grease, paint, and coatings. The use of liquid nitrogen is an expensive process. Liquid nitrogen requires proper space and equipment for storage and handling, which leads to higher costs. Parts can get distorted or damage due to the extreme temperatures. This method cannot be used to clean parts with epoxy or urethane coatings. It is only useful when cleaning components with thick coatings. The reasons why burnoff ovens are the most popular method is that they eliminate most of the disadvantages of the other cleaning methods, while providing the same benefits. Burn-off ovens clean with heat to strip virtually all organic materials from paint and powder coating lines. The ovens can be used to clean different types of products, irrespective of size of shape. These can include racks, hooks, baskets, load bars, grating, and fixtures. Burn off ovens can be used for steel, as well as aluminum parts. It can be used to clean small as well as large batches. The components can be placed into the oven easily via a roll out cart system. ACE Burn Off ovens utilize a Radiant Tube (RT) heating technology, which combines convection and radiant heat to clean the parts. The oven has an afterburner chamber, which provides air to combust all smoke and ash completely. Any discharges to the atmosphere are harmless byproducts. The One Touch Control (OTC) System is easy to understand and use. Hence, the operator does not have to be an experienced personnel. If the oven heats up too quickly, the oven’s water sprays get turned on automatically to reduce the temperature. The oven is constructed from 11 gauge steel, with high temperature, rust resistant paint, and high temperature insulation. These features ensure that the heat and harmful contaminants stay within the oven, and does not harm the personnel outside. The oven saves energy up to 20% more than conventional burnoff ovens. 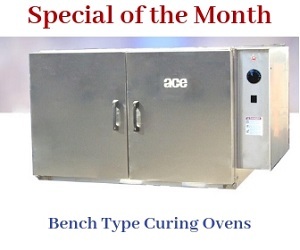 These various advantages validate the importance and popularity of ACE burn off ovens in the market today. If you would like more details on the ovens, please click here.